Jump in- the water is great! The Crockett House is a charming Victorian house that was built in the early 1900’s and is located only minutes from Historic Main Street. The house sits on a large corner lot and offers plenty of well landscaped outdoor space and porches for relaxing. The house features tall ceilings, natural wood floors and bead board walls and takes you back in time in luxury. There are four cozy well decorated private bedrooms with king and queen beds and two private bathrooms. Next to the main entryway downstairs there is a nice spacious living room with a stone fireplace to gather together. There is a full kitchen with plenty of wineglasses, cookware and utensils for your convenience as well as an attached dining room that opens to the spacious backyard. The private backyard outdoor area features a large pool surrounded by palm trees with plenty of seating and lounge chairs for relaxing and star gazing. Next to the pool is a covered outdoor bar and kitchen perfect for serving drinks, appetizers, and meals. There is also an outdoor dining area under a covered pavilion to sit out and enjoy a glass of wine or your morning coffee with your friends. Crockett House is the perfect place for a girl’s get-away shopping weekend, family gathering, or a memorable couple’s retreat. Interested in taking a wine tour? Be sure to call Texas Wine Tours at (830) 997-8687 or book online. Beautiful home just a few minutes drive from main street. It was spacious, clean, and had everything we needed. We really enjoyed our stay and would highly recommend it to anyone needing a place to stay in Fredericksburg. We all absolutely loved the Crockett House! I would love to stay in this house again come summer so we can enjoy the pool next time! This house had everything we needed in a good location. House was large enough for four couples. Beautiful and historic home! Great place to reconnect with friends and family. A group of girlfriends and I had such a wonderful stay at the Crockett house. It was clean, spacious and in a perfect location. 8 of us slept very well with 3 plush king beds and a comfortable queen. There was plenty of space to come together, cozy up and enjoy the lovely wine we brought back from the winery’s. The outdoor area was so spacious with a large pool and outdoor grill area which we hope to be able to use on our next trip out during warmer months. Highly recommend this charming house! This was such a cute place! It was really close to Main Street AND really close to Enchanted park. The beds were very comfortable and the house was unique and lovely. There\'s a pool in the backyard that we didn\'t get to use but it would be perfect in the warmer months! I recommend this place! This house is a perfect spot for a weekend get away! The house has plenty of space, the rustic look is authertic, the location is in a great area and near so many things. My favorite part was waking up in the morning and only being 20min away from Enchanted rock state park, just close enough to beat the crowds! I had an amazing time at this cute home. We used this house for a small girls weekend and it accommodates so well! The house was a 3min drive to Main Street where we easily hopped on a wine tour bus. The house has an awesome spacious backyard and cute decor that was perfect for photography. I would love to stay at this home again! This beautiful house has an incredible amount of charm and a very unique historical character. We can't wait to go back and stay again!! This place felt like a home away from home! It was very clean, spacious, cozy, and worked so well for our group! I can\'t wait to come back and enjoy the other amenities when it\'s warmer out. I highly recommend the Crockett House for those wanting an authentic Fredericksburg experience. Wonderful place for family get together. Quiet neighborhood with active walkers. 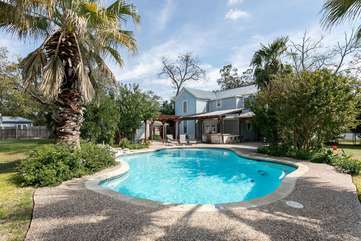 Great place to crul-up with your favorite book by the fireplace or by the pool whichever the weather permits. Close to downtown to enjoy the great Fredericksburg restaurants and shops. Hope to return soon to enjoy warm weather activities. Great place; well equipped with all the comforts of home. Our group of 4 ladies had a wonderful stay at Crockett House (formerly Dalton House) during our recent fall \"Mama\'s Weekend Off\" this year, and I\'d definitely return in the future with a group of girlfriends or for a family gathering of up to 8 people. The quiet, tree-lined, historic neighborhood feels very safe and occupied mostly with local residents who were universally friendly to us as we walked & jogged the streets. Main Street and the Marktplatz are only 8 blocks away (about a mile, a 20-minute walk), very accessible for a fit adult with comfortable shoes. We did have our winery tour bus pick us up right at the front door, so the driver had no problem finding the place. The charming Victorian home (built in 1904!) had more than enough space for us all, yet felt cozy, comfortable, and clean. There is plenty of seating and the beds & showers were fine. I especially loved relaxing on the 2nd story porch to drink my morning coffee and watch the friendly fitness walkers go by. We mostly ate our meals at the many wonderful local restaurants around Fredericksburg, but the home\'s fully appointed kitchen served all our other needs and would have easily managed a full family meal if we had been in the mood to cook. The full-sized refrigerator held all of our snacks & cold drinks, the microwave looked brand-new, and the coffee machine worked great. The weather was a bit too cool & wet during our visit for it, but the backyard pool and outdoor kitchen looked fantastic for warm weather outdoor entertaining. They even have a washer/dryer combo in the utility room out there, so dealing with all the kids\' wet swimwear before heading home would be no problem. If nothing else, just lounging back there for a BBQ & drinks with a few yard games would be a blast.